Chicago Mayor Rahm Emanuel talks with residents at a senior living center during a campaign stop on February 23, 2015 in Chicago, Illinois. A few years ago, violence on Chicago streets thrust a recently elected mayor into the national spotlight as shootouts in some of the city's most troubled neighborhoods fueled nearly constant bloodshed. Rahm Emanuel spent nearly $200 million over two years to flood those streets with police working overtime. His police department also collected a trove of information about individual gang members and set up meetings between gang members and the parents of homicide victims to illustrate the high human cost of gunfire. Since then, the city's overall violence has declined, but the number of slayings in some minority neighborhoods actually jumped. And while police boast of historic drops in the homicide rate, many frustrated families in those areas say their communities have seen little to no improvement or have actually deteriorated. "It's worse," said Anthony Jackson, a 62-year-old retired maintenance man as he made his way to his home in the heart of a neighborhood that last year saw a dramatic spike in homicides — to about half the number of the entire city of Washington, D.C. "We're just out here on our own." The stubborn violence contributes to the mayor's overall challenge in his bid for a second term and puts him in the somewhat awkward position of simultaneously touting his success against crime while acknowledging that much more needs to be done. 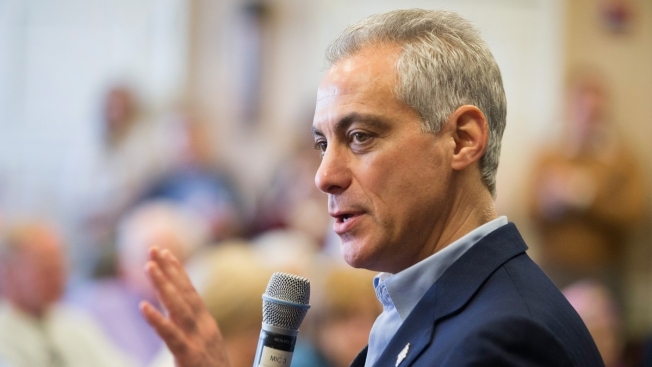 "The truth is that as much progress as we've made over the past four years, we simply have to do better," Emanuel said in a speech. The total number of homicides in Chicago fell from more than 500 in 2012 to just over 400 last year, the lowest level in a half-century. But the number of shootings climbed 12 percent, from 1,866 to 2,084, during the same period. The discontent goes beyond the bullets. Despite Emanuel's success in attracting companies to the thriving Loop district, the only businesses that seem to survive in many minority neighborhoods are dusty markets, fast-food restaurants and dollar stores. The result was that Emanuel did not receive enough votes last month to avoid an April runoff with Cook County Commissioner Jesus "Chuy" Garcia. Much of the support the mayor had from black voters four years ago vanished in the primary. Though Emanuel was the clear winner in every majority-black ward, he received fewer than half the votes in them. Four years ago, he received more than half the votes in every single one. A Chicago Tribune poll published Tuesday shows that Emanuel has opened a 28 percentage point lead over Garcia — largely by making gains among white voters. There was little change among black voters for Emanuel or Garcia and, while Garcia has the support of 52 percent of Hispanic voters, Emanuel has 36 percent. The poll has an error margin of 3.7 percentage points. Jackson said he voted for Emanuel in 2011, but he doesn't know who he will support in the April 7 election. In the Harrison police district, where Jackson lives, the number of homicides climbed from 35 in 2013 to 51 last year, and the number of shootings climbed at more than double the citywide rate. Police have not offered a definitive reason other than to point to what Superintendent Garry McCarthy calls "severe gang conflicts." And Emanuel's decision to close dozens of schools added more boarded-up buildings to streets already littered with them, with residents complaining that the schools became larger versions of the abandoned houses that are magnets for gangs and drug dealers. "What people see is these parts of the city have been abandoned, and the investment has gone elsewhere," said Marshall Hatch, a prominent minister on the city's West Side, standing near the shuttered Goldblatt Elementary School. Statistically, there is plenty of evidence that the city's crime-fighting strategies are paying off. Since 2012, reports of every major crime have dropped, some significantly. The 504 homicides that caught the attention of the nation in 2012 have fallen to a level not seen since the mid-1960s. It's the same story with robbery, aggravated battery, burglary and motor-vehicle theft. There were fewer reports — sometimes hundreds fewer — of those crimes than two years ago, including in Jackson's community and other largely black neighborhoods. How Accurate Are Mayoral Polls? For example, in the Grand Crossing district on the South Side, 2014 ended with 18 homicides — less than half the 42 recorded in 2012. Still, even in that area and in other nearby communities, Emanuel did not receive nearly the percentage of votes that he did in 2011. In his campaign, the mayor has addressed the fears stirred up by the death of an 11-year-old girl who was killed by a bullet that pierced a wall while she made s'mores during a sleepover. And he acknowledged the slaying of Hadiya Pendleton, a 15-year-old honor student killed shortly after returning from President Barack Obama's inauguration. "Too many families still have their kids off the porch when it gets dark. Too many families ... do not let their kids go outside because they're scared," the mayor told the audience after an introduction by Hadiya's mother, who praised Emanuel as someone who feels the pain of those who have lost loved ones to gun violence. Garcia has pledged to hire 1,000 police officers. Without the added police presence, he said, the city "will never be able to end the heartbreaking violence that has taken the lives of so many of our children." Emanuel also finds himself courting black votes in the wake of a study by the American Civil Liberties Union of Illinois, which found that the police department's "stop and frisk" practice disproportionately targeted blacks. Pence in Op-Ed: "I Abhor Discrimination"
Hatch said he fully expects Garcia to cite the report as another example of Emanuel's failure to help the black community. "Everybody holds the mayor accountable because, like we say in the black church, he's got all the power in his hands," he said.